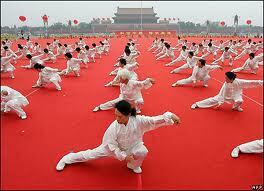 I have wanted to try Tai Chi for a few years now but have never got around to it. I was surprised and delighted when I joined the West End YMCA to find they have an hour and a half course on Sundays. Problem was, I had an injured knee and have off it for 7 months. Now that it is about 90%, it is time to get back into action. Tomorrow night I have my first fencing practice since May and thought taking Tai Chi today would be a great non impact way to try my knee out. Jody, our instructor practices, the 24 move form of Tai Chi to start. I have no idea what that is but I think after today I have the first part of the first move down, but very, very rough. I enjoyed the class and my legs really feel it. The half hour of stretching we do before getting into routines will be very good for this stiff body of mine. I'll be back next week and any Sunday that I do not have a fencing tournament. I believe this will be a great addition to my fitness program.